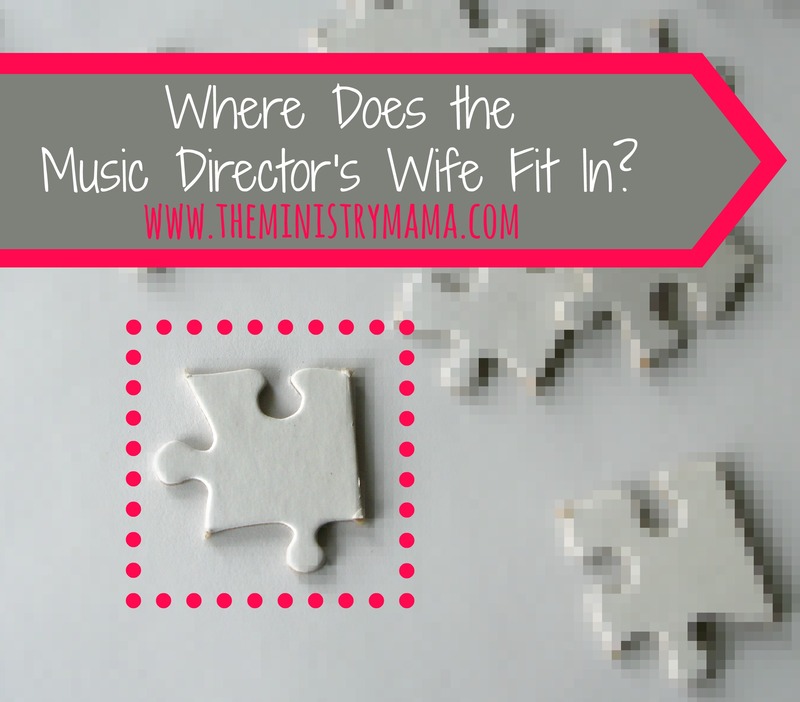 Where Does the Music Director’s Wife Fit In? Why is it when you meet people in the ministry or others for that matter, and they ask you where you work (insert name of church here) and then want to know what your husband does (insert job title here), and you answer, “I’m the music director’s wife.” People will either A.) accept you or B.) typically look confused because they wonder what it is that you do because you don’t fit into their preconceived notions of what ministry is all about. Who knew that those three words could cause confusion among people who are waiting to hear the two most common women’s positions in ministry, “pastor’s wife,” and “youth pastor’s wife.” We like to shove people in our minds into these specific holes of ministry. We like for people in our minds to fit into common positions like a plug easily goes into an outlet. It is not necessarily an entirely negative thing not to know what one does when a title like “music director’s wife” is given. But my thinking is, maybe we emphasize titles a little too much. There are moments when I give my answer of “who” I am in relation to my husband’s job and see the interest others have in me (as a person) dissipate when I did not match up to what they hoped I was. It is so bad there have been times it makes me doubt this place in the ministry where God called our family. I have been the round peg being shoved into square holes. Why when others seem to point it out by asking the dreaded question does it make me feel like a failure in some area because God has not directed our family into the same ministry as others? A few months ago, I believed God opened a door to allow me to become involved in a new prayer group of pastor’s wives. I joined the online group with permission and introduced myself as a “music director’s wife” and within a day was written and told that other pastor’s wives had question why I was allowed to be in the group if I really was not a pastor’s wife and eventually because of things I said was no longer able to be a part of the group. My heart was grieved to say the least because there was no room for my husband’s title to fit in their group. I wish I could have explained that I see the background of our church’s hurts too and pray about those hurts as God places them on my heart. The people, building, and projects are our purpose for following God’s call to where we serve. We spend a lot of time as a family doing things around the church, like pastor’s wives and youth pastor’s wives do across the world. We love raising our kids in ministry and have the same concerns for our children’s spiritual welfare as women who have those titles do. We battle the same enemy, we serve the same Saviour, and we are all equal at the foot of the cross. My value is greater than a measly title. What does the music director’s wife do? She is the music director’s wife and caretaker of his heart. She is the mother of the music director’s children. She is the keeper of the music director’s home. She is the music director’s helpmeet both at home and in ministry. She plugs in perfectly to the ministry outlets God has created for her to do within the church. She bears the burdens of the music director’s heart and shares time in discussion and prayer about those matters. She ministers to the people who come into their lives. The choir, his Sunday School class, and more. She serves where God opens doors for her to do so. She is ultimately the daughter of the Heavenly Father. 1 Corinthians 12 teaches how the members of each church all have a specific purpose and work to do within that church. The illustration is used of a body and all of its parts being different, but necessary to be able to serve their purpose. My favorite verse in that passage pertaining to fitting people into our own ideas for what they should be and do is this one, “But now hath God set the members every one of them in the body, as it hath pleased him.” 1 Corinthians 12:18. So, where does the music director’s wife fit according to this verse? In the place where God chose to set me in the body of Christ, as it pleased Him. Give me one reference to a ministry wife’s title and job in the Bible. There are not any, apart from the regular instructions that were given to married women. This gives me a relief to know that I am able to fulfill the work and purpose God gave me to do personally. The abilities and talents God gave me were not for youth work and He has not seen fit to place me as a pastor’s wife either. And believe me I’m okay with that! My place has been to fill in gaps and serve in various flexible capacities in our church. Every year and as we have had more children, there have been some adjustments that have needed to be made to go hand-in-hand with the needs of our family and my service to the Lord. The hole I fit into changes all the time. I’m me. Love me for who I am and for the place God was pleased to set me within the body of Christ.